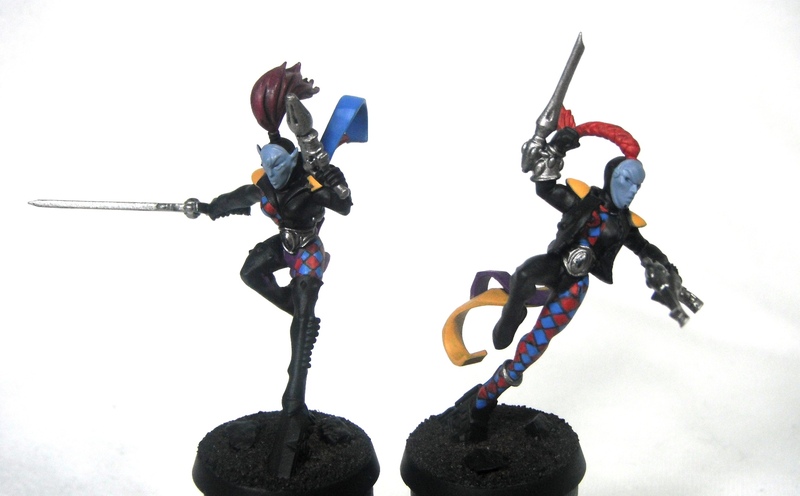 I have started work on two more Harlequins to join my troupe. So fat they have had the main colours blocked in. Just washes and highlights to go. More details on how they were painted can be found in my previous post. 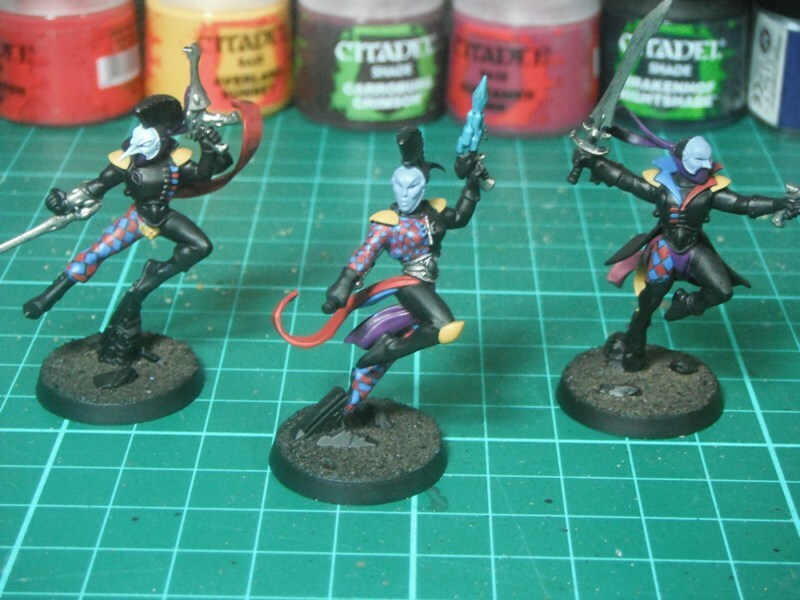 The first three Harlequins are finished and based. It has been really satisfying seeing these models come together as they are very different to the Astral Claws and Lord of the Rings models I have been working on recently and are totally unlike anything I have painted before. They feature far more extensive freehand than I have ever painted on a model and the diamond patterns are quite tricky. However, I have learned a few tricks along the way and I’ll share these with you below. For the colour scheme I opted for the ‘Masque of Midnight Sorrow’ as the three primary colours look very effective and it was their picture on GW’s website that really attracted me to the Harlequins in the first place, particularly the deep purple/red colour of their vehicles (which I will try and replicate on my own models at some point in the future). 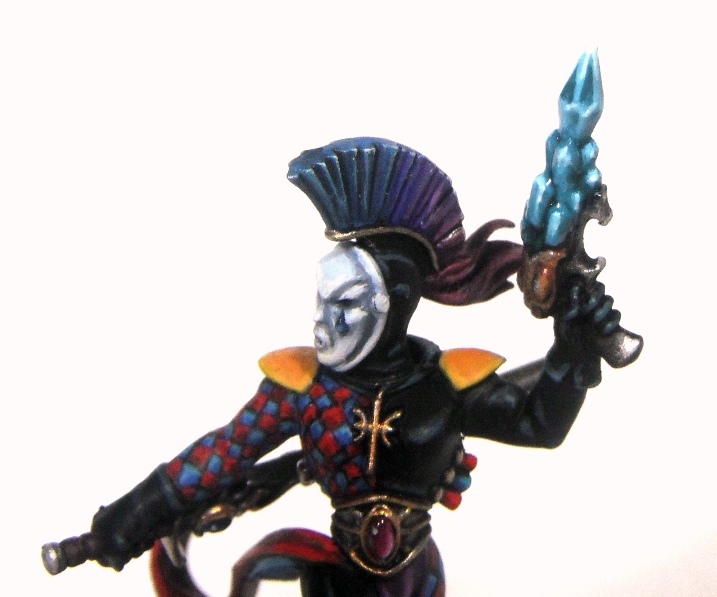 This lady was the first of the Harlequins I painted and I learned a lot about painting diamonds working on this model. 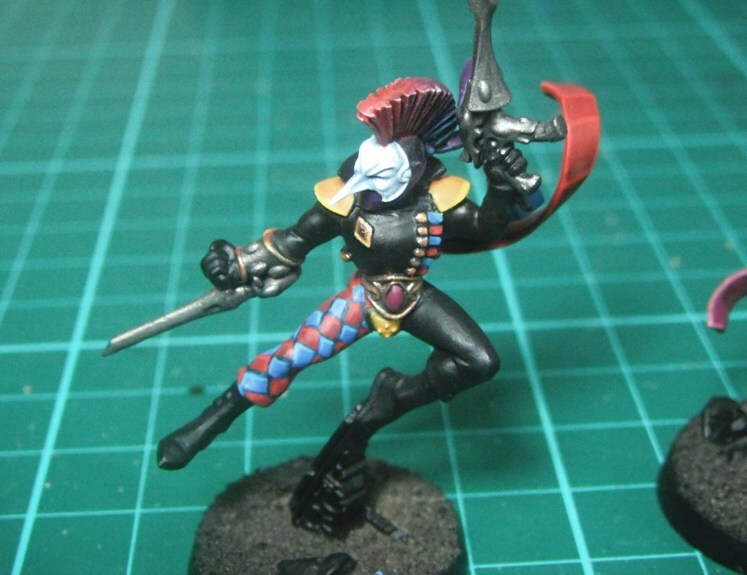 Firstly, I would encourage any Harlequin painter to think very carefully about the placement of the patterned areas. You want a nice clear area that you can get good access to with a paintbrush. Also, straight limbs are easier to paint the pattern on as you don’t need to worry about how the pattern will follow the contours of the fabric. 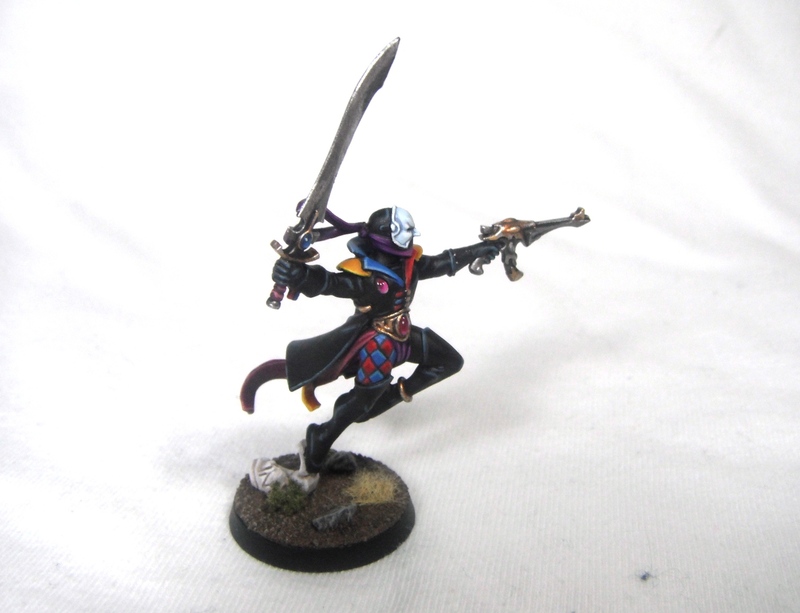 On this model, for example, I made the mistake of choosing to paint the right sleeve with the diamond pattern. However, the problem with this was the fact that the model is holding a sword in a backward grip which obscured the back of the sleeve and made painting this area very fiddly. In the end I resorted to the unorthodox method of carefully snapping off the arm, painting it as a separate piece and then gluing it back on! I would also think carefully about the size of the diamonds. Smaller diamonds are obviously harder to paint. Also, from a distance the effect is a little indistinct whereas larger diamonds stand out better. 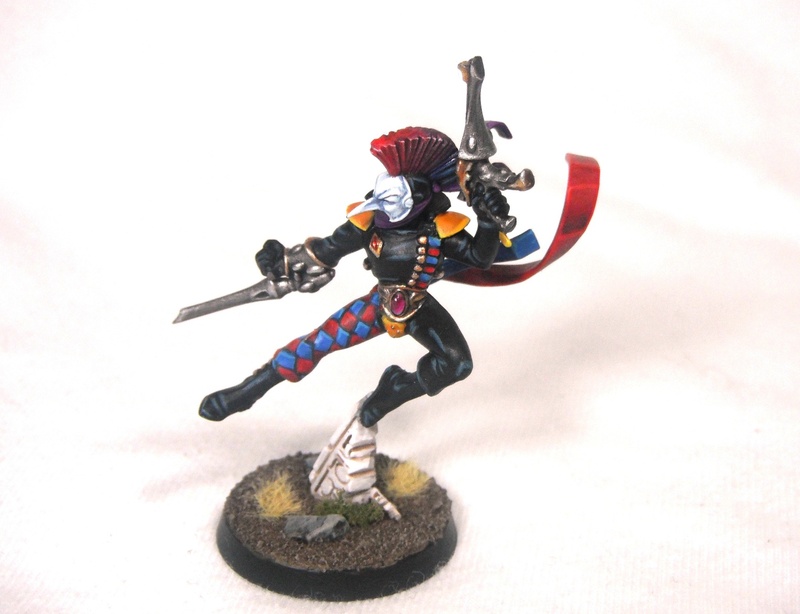 This chap is one of my favourite Harlequins. I really love the mask with the phallic, beak-like nose; it reminds me of one of the extras from the masqued ball scene in the film Labyrinth. 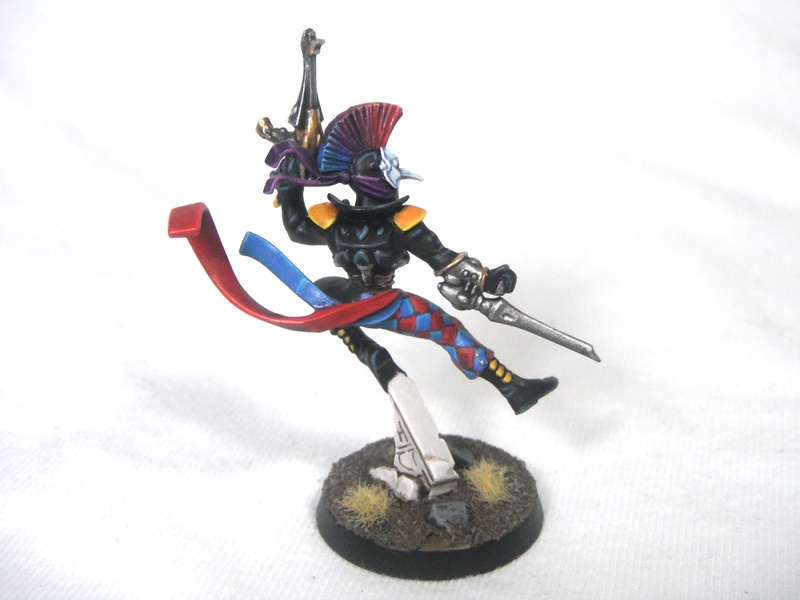 The pose of this guy is copied directly from one of the old metal Harlequins from when the range was first redesigned back in 2007. A number of the components of this kit match the design of those earlier models (the Troupe Master being a particularly obvious example) so it is possible to recreate them in plastic should you wish to do so. 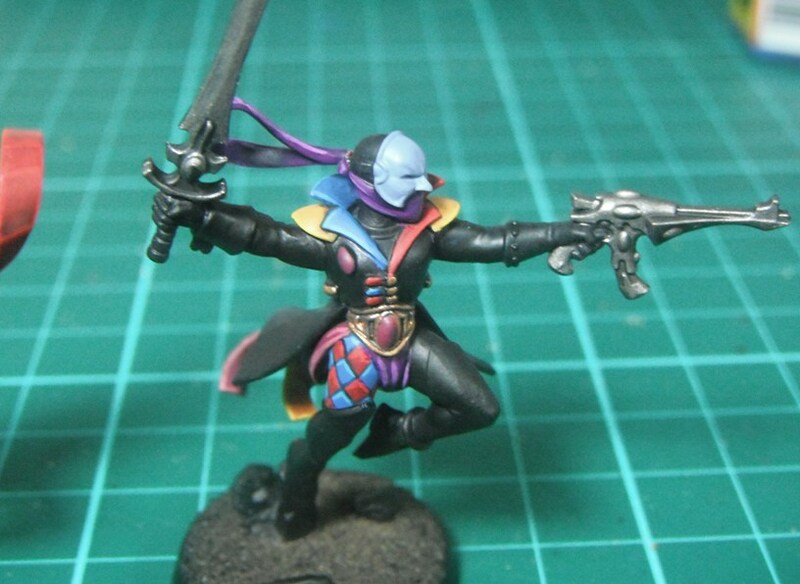 This guy is my favourite of my Harlequins so far. I really love the mask and his pose is very dynamic as he leaps forward into battle with his coat billowing behind him. 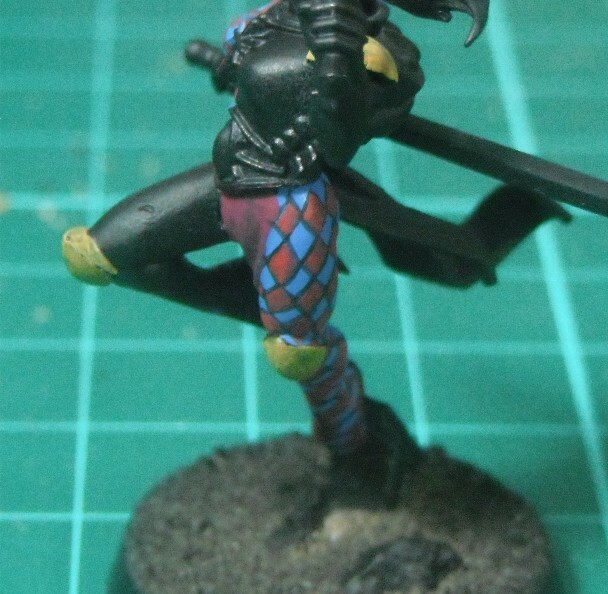 One of the lessons I learned with this model is just how fragile some of the Harlequin components are and I accidentally broke the scarf that trails behind his head while painting him. This was easily repaired by drilling a small hole in the knot of the scarf and gluing the end of the scarf tails in with polystyrene cement but it does demonstrate how delicate they are. When painting the models this is something to be aware of. One tip for avoiding this is to blue tack the model to a wine bottle cork and use this to hold the model in order to minimise how much you need to handle the figure itself. For this I use corks sold for home-bottling wine rather that ones taken from wine bottles as a) most wine these days doesn’t come in corked bottles and b) used corks are misshapen and will not stand straight. They are dead cheap and readily available from shops such as Wilkinsons. Another thing you may notice about this model is the red and blue lapels; this was another way of introducing some colour without having to spend ages painting tiny diamonds. Not only is this a time-saving device but it stops the model looking too overwhelming. I find it better to judiciously apply diamonds to specific areas rather than go overboard. From the back you can the diamond pattern I airbrushed onto his coat using stencils cut from masking tape. Full credit for this idea goes to Tim Davis (aka Dezartfox) over at The Vanus Temple who wrote this tutorial on the subject. When I first saw his Solitaire on Twitter I was so impressed by the subtlety of the effect that I knew I had to give it a go. 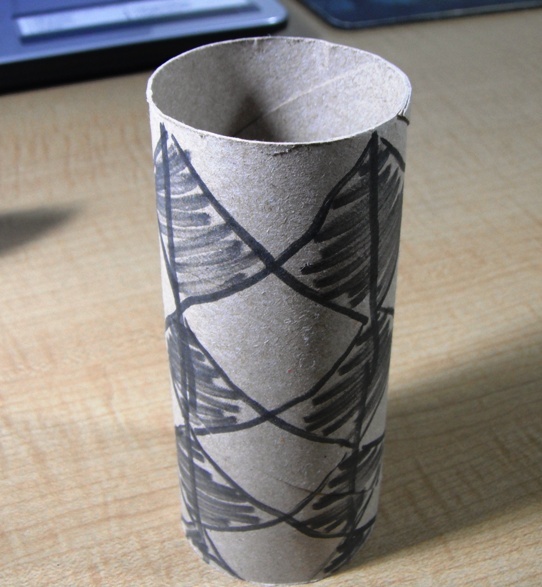 I used a pencil and ruler to mark out squares on a strip of masking tape and then cut them out with a sharp craft knife before sticking them at an angle onto the coat. Eshin Grey and Codex Grey were gently airbrushed on starting dark and blending up to a lighter colour at the bottom to get the fading pattern. This simple technique looks great and adds some interest to what might otherwise have been an empty surface. 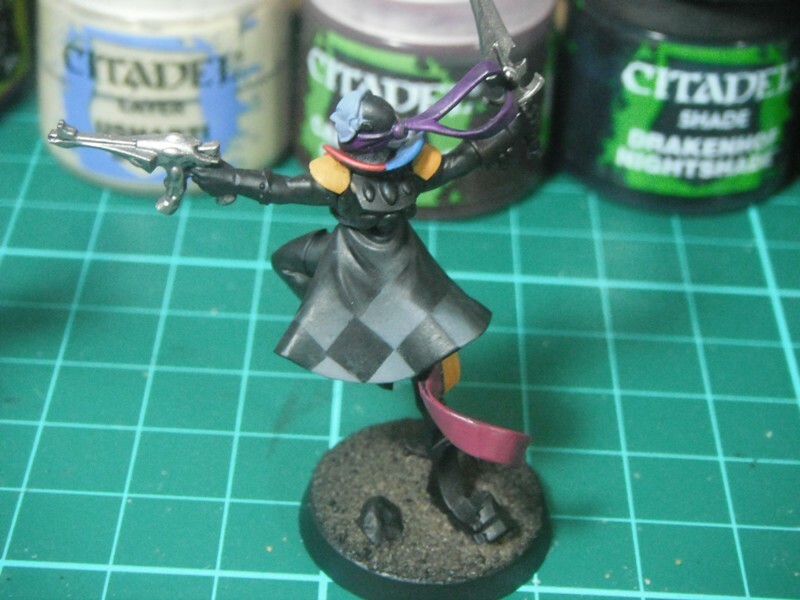 When painting the Harlequins I started out by blocking out the basic colours. 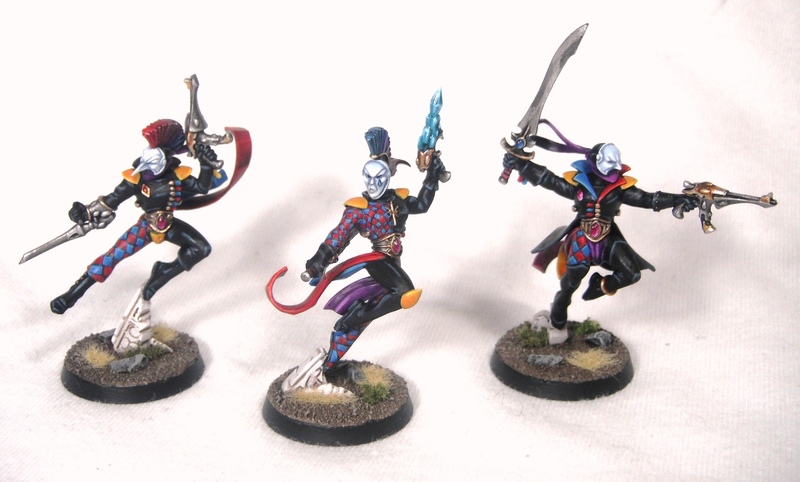 While this is a useful technique for any model, for models as colourful as the Harlequins it is important to make sure that you are getting the colour balance right. I did this using Balor Brown followed by Averland sunset for the yellow (the brown provides a better base for the yellow that painting directly over a black undercoat), Mephiston Red for the red, Liche Purple for the purple areas, Screamer Pink for the red/purple areas and Lightning Bolt Blue for both the blue and the diamond patterned areas (the red would be added later). The masks were basecoated with Russ Grey. For the diamond pattern I found that the hardest thing was getting the pattern to join up at the back. Through trial and error and much frustration I came up with the idea of painting vertical lines of thinned Abaddon Black down the front, back and either side of the arm or leg at even intervals. I then painted a series of crosses in the columns created. This ensures that all of the diamonds line up and that there are an even number of diamonds going around the area (essential so that you can alternate the colour of the diamonds and not end up with two diamonds of the same colour side by side). After this, the pattern was filled in using Mephiston Red. The tops of the diamonds were then highlighted with two sharp lines using either Temple Guard Blue or Evil Sunz Scarlet. Hopefully you can see how the lines create colums which are then filled in with crosses to mark out the diamond pattern. I have previously written about painting black on this blog. 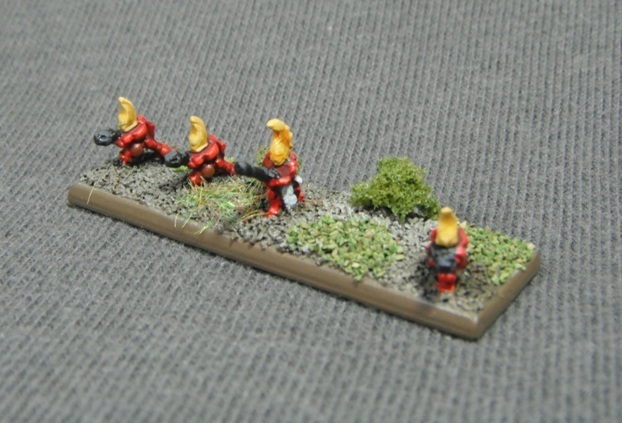 However, I have found that since the new Citadel pant range has been released painting black has become a lot easier and I have a new, quicker method which is perfect for painting rank-and-file troops (I still use my other methods but these are best saved for characters or display models). 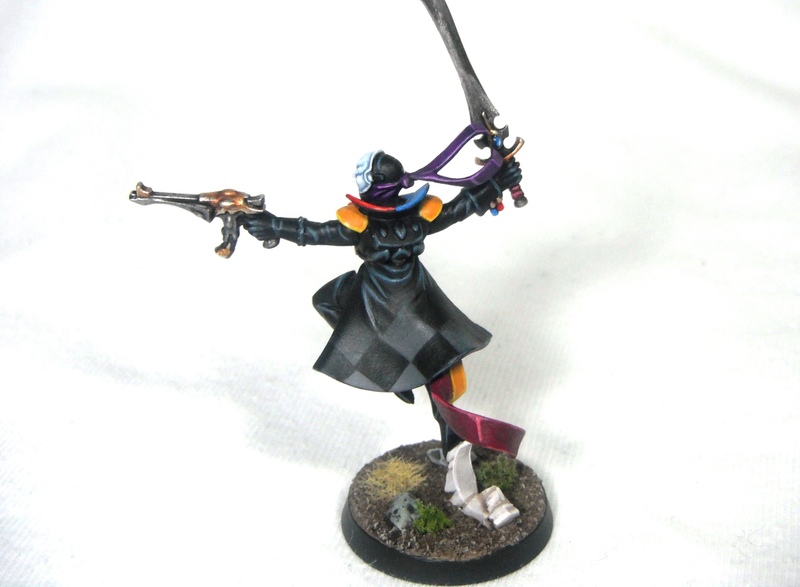 For the Harlequins, I simply highlighted the black areas using Dark Reaper followed by Thunderhawk Blue. This produces a nice blue/black look which is simple to achieve and takes no time at all. 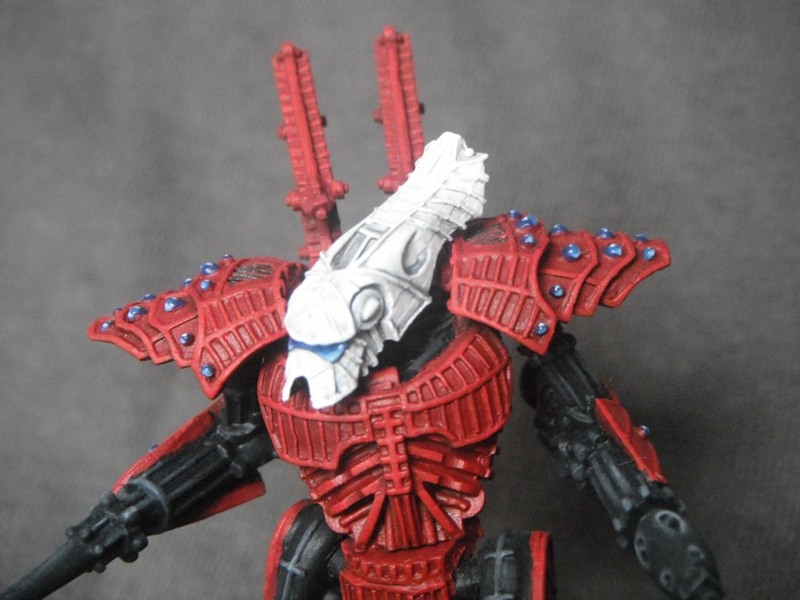 The masks were painted Russ Grey and highlighted using a mix of Fenrisian Grey and White Scar up to final highlights of pure White Scar. As these form the faces of the models it’s worth taking your time over this stage and using lots of thin layers to build up a smooth finish. 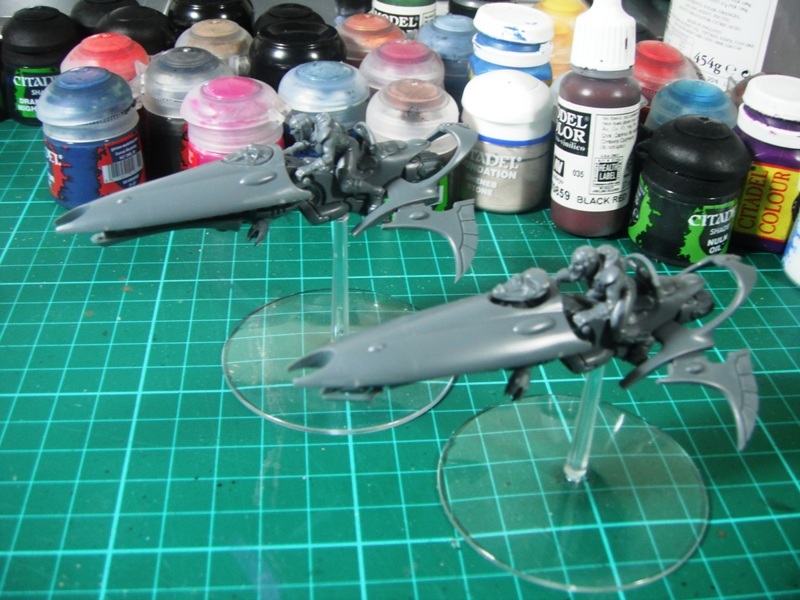 I have also started to assemble some Skyweaver Jetbikes. Together with a converted Viper. I’ve had the viper since it was first released (it was something of an impulse pre-order). 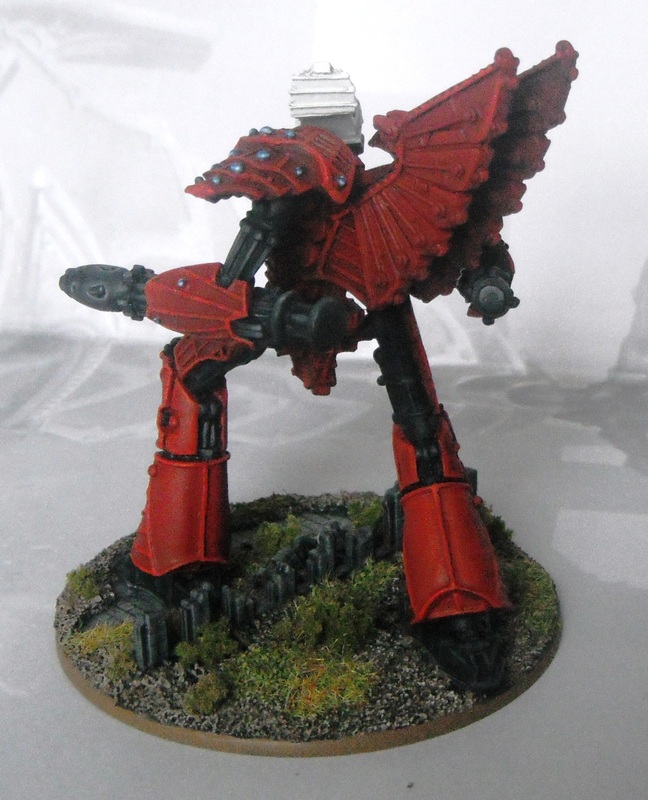 Originally I was going to convert it into Nuadu Fireheart (an old Saim-Hann character) although it never happened and the model has languished in a box ever since. 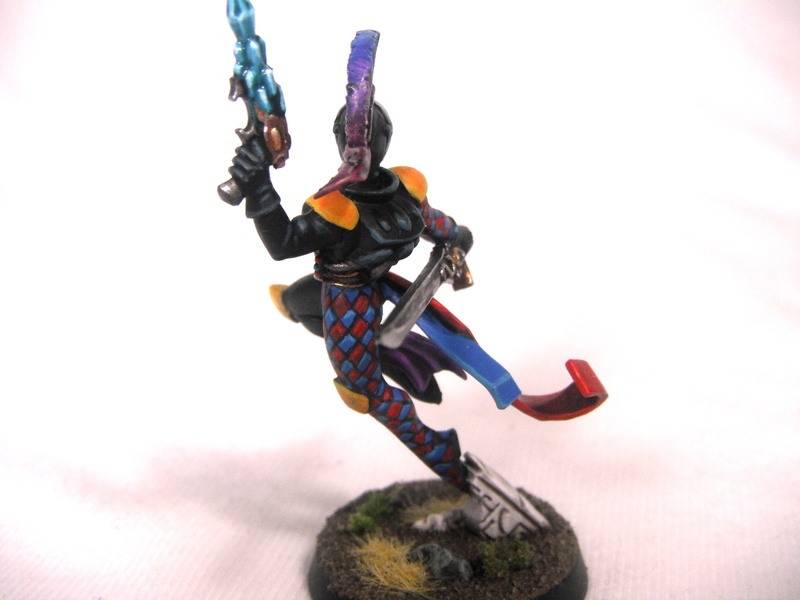 Maybe the Harlequin release will finally provide me with the motivation I need to actually do something with this model. 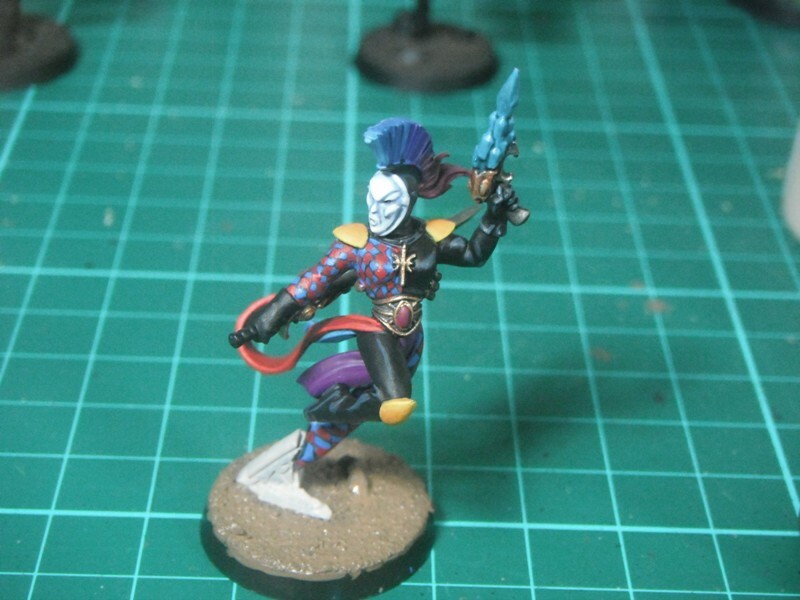 With it being half-term I have been making good progress on my Harlequins. I must say that the new models are fantastically dynamic and a real joy to put together. One of the cleaver aspects of the design is the separate heads and masks which give you a great deal of choice when putting the models together. 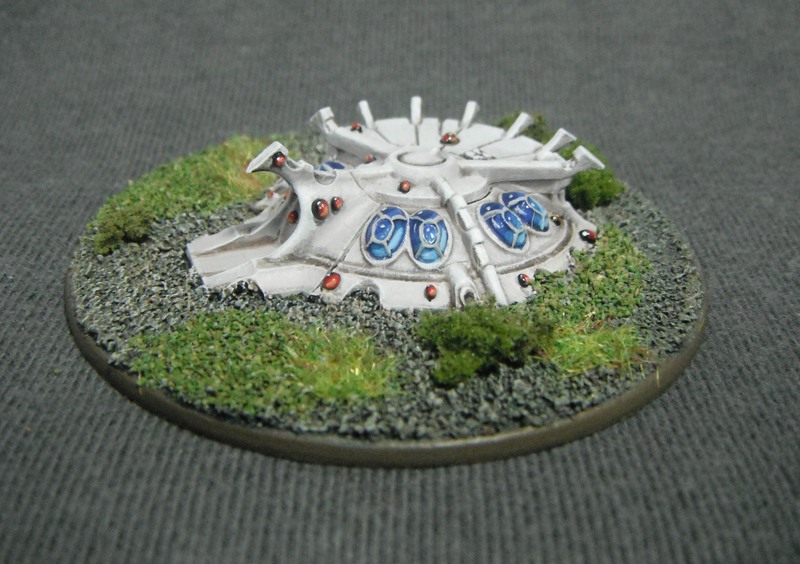 For the colour scheme I decided to go with the one on the box as this will help to tie them in with my planned Craftworld army (currently three half-painted grav tanks). 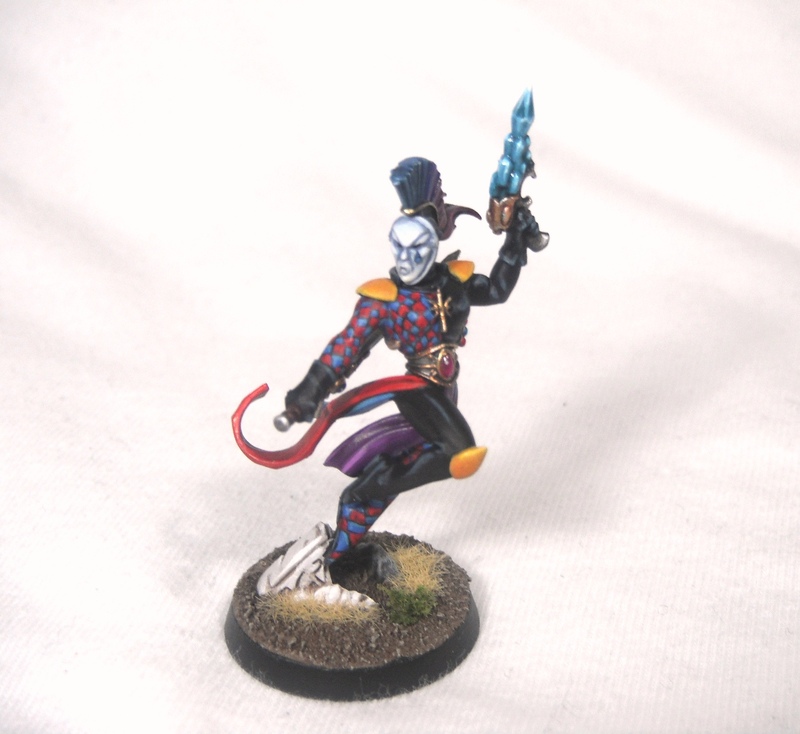 The diamond pattern is quite time-consuming but it looks great and is such a defining feature of the Harlequins that I couldn’t leave it out. 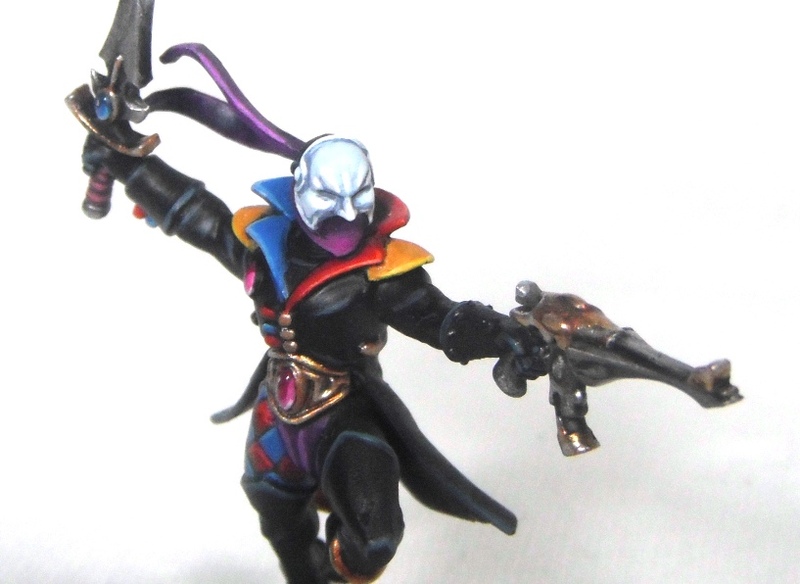 Speaking of diamonds, @Dezartfox posted a great tutorial over on The Vanus Temple on airbrushing diamonds onto Harlequin coats. Needless to say, I was so impressed with the results I went ahead and stole the idea. It’s a really nice subtle effect which will add some interest to large flat areas which might otherwise end up looking a bit lifeless. 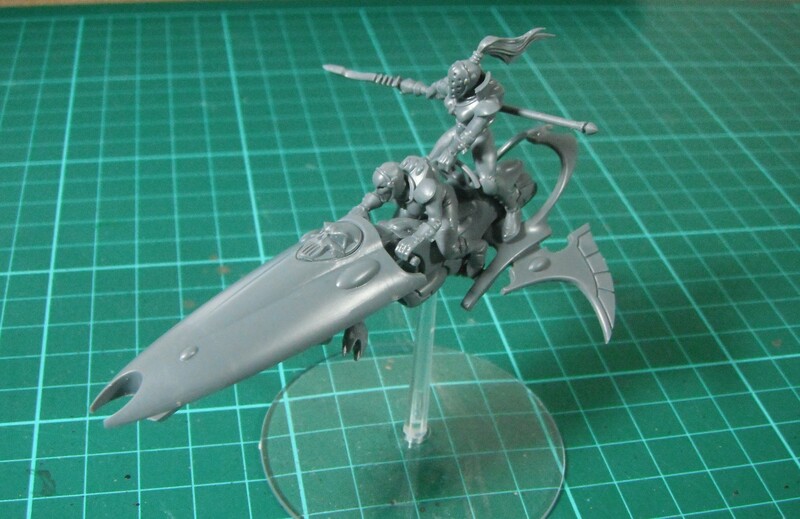 I also received a couple of boxes of Skyweaver Jetbikes in the post which I have started to assemble. Stay tuned for more. 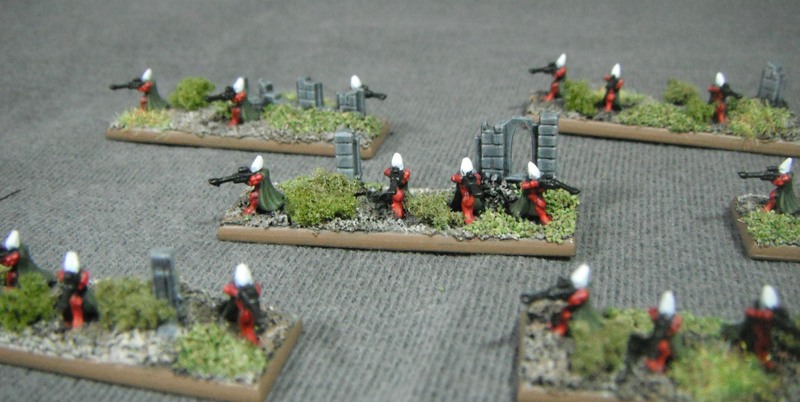 A while back I mentioned having purchased some new objectives for my Eldar army. Well, I’ve finally managed to get round to painting them. 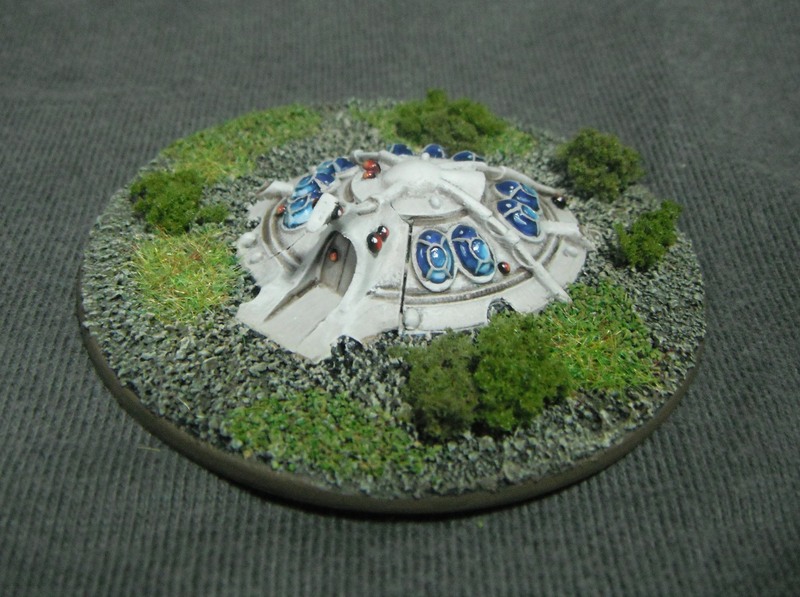 The models are ‘Space Elf Bunkers’ and were sculpted by James Rossillon (aka semajnollissor) from over at the Tactical Command forums. What I really like about these models is the fact that they fit in with the aesthetic of the Eldar army without being direct copies of Games Workshop’s designs. 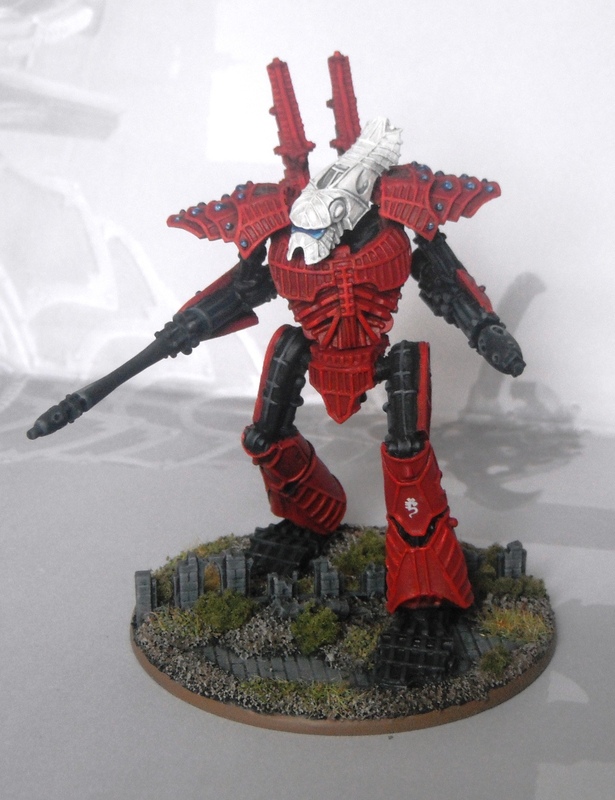 I don’t believe that the Eldar wage war from fortified positions in the same way that the Imperial Guard do. 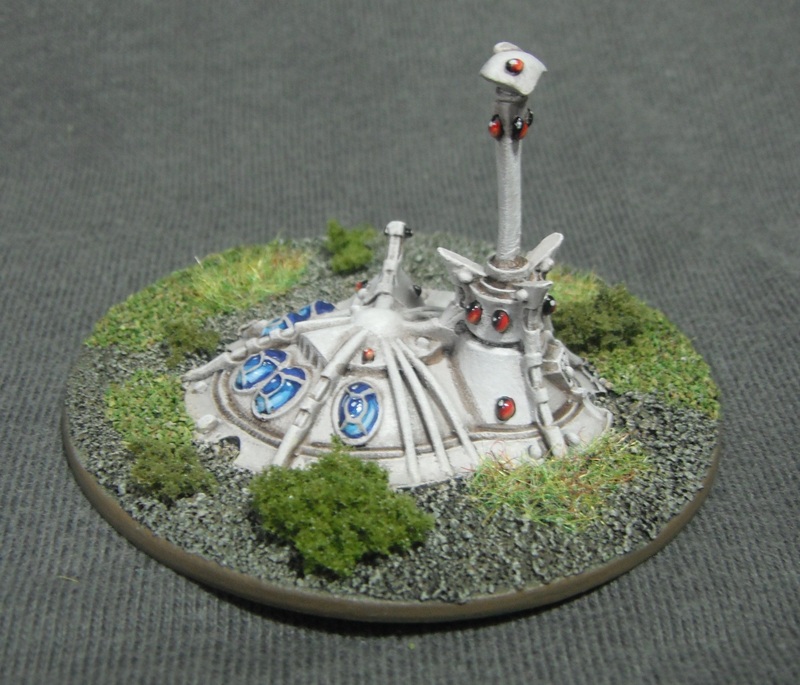 Instead I imagine that these bunkers form part of a listening post designed to keep tabs on the movements of other races and report back to the Craftworld. 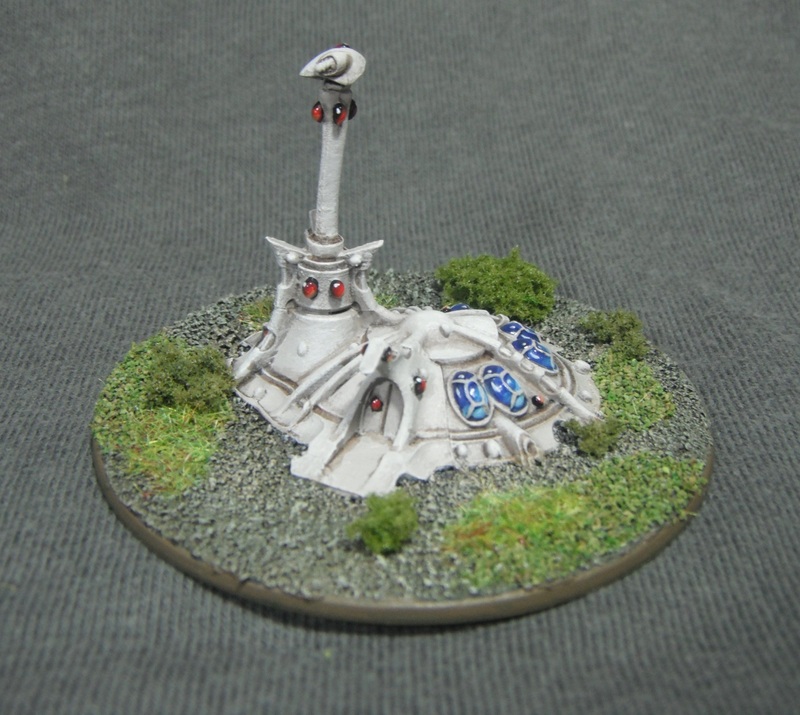 In order to add to this feel I slightly converted the ‘Tower Bunker’ by attaching a sensor array to the tower made from part of the backpack of an old Eldar artillery crew model. 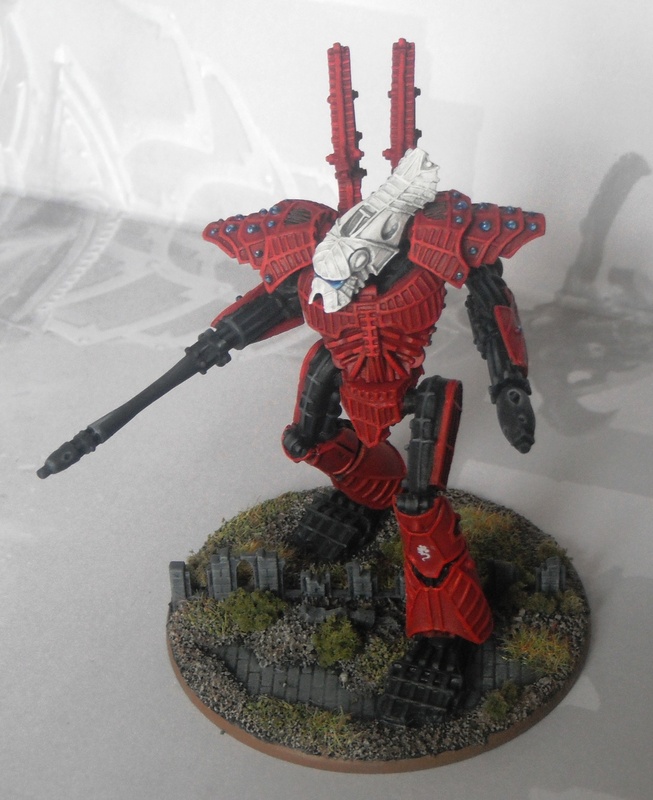 The Wraithbone structures were painted Dheneb Stone and washed with Devlan Mud to shade them. I then highlighted them by adding increasing amounts of Skull White to Dheneb Stone all the way up to pure white for the final highlights. At this stage they looked rather boring but this is where the fun begins: painting the glass effects. 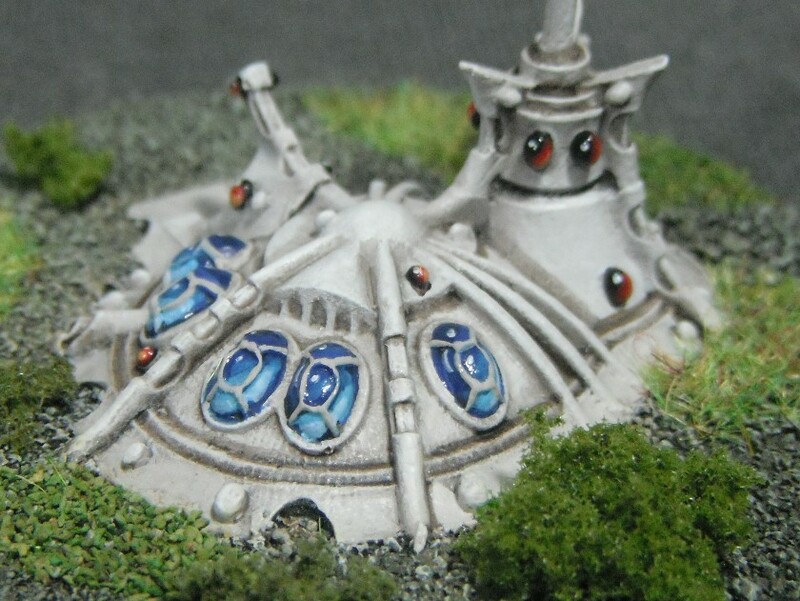 I really enjoyed painting the gemstones and windows on these models. The gems were painted Scab Red followed by highlights of Red Gore, Blood Red, Blazing Orange and finally Vomit Brown. I’m sure you’ve probably seen articles on painting gems in White Dwarf or on GW’s website but for those who haven’t I’ll briefly explain the process I used here. When painting gems you need to highlight the underside of the gems away from the imagined light source. This produces the effect of the light shining through the object rather than simply bouncing off it (as with an opaque object). Hold a coloured glass bead up to the light and you will see what I mean. The effect was them completed with a dot of Skull White on the top of the gem were the light would strike it followed by a coat of gloss varnish to add a nice sheen. For the windows I used the same technique, ignoring the window frames at first. This time I started with a base of Regal Blue followed by Ultramarine Blue, Ice Blue and finally Space Wolf Grey. As you can see from the close-up below, I added white reflections to each of the three top window panes that would catch the light rather than just to the top as on the gemstones. I then went back and carefully painted in the window frames with Dheneb Stone before gloss varnishing the glass. The models then had a mixture of different flocks and clump foliage added to the bases to match my Eldar army. 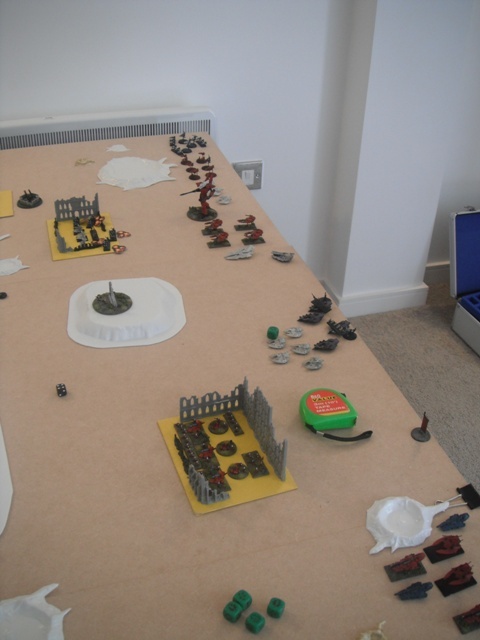 In my previous post I mentioned that I played a game against Gus’s Steel Legion Imperial Guard on Friday. 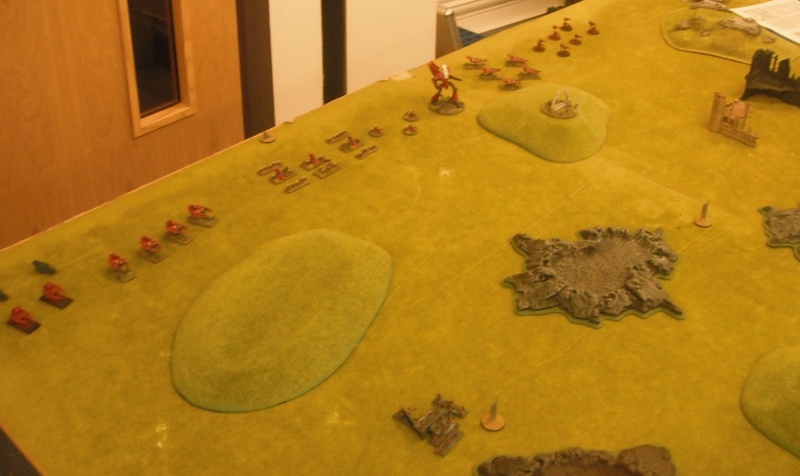 Since then Gus has posted up some pictures of the battle on his blog. You can see my army in action here. 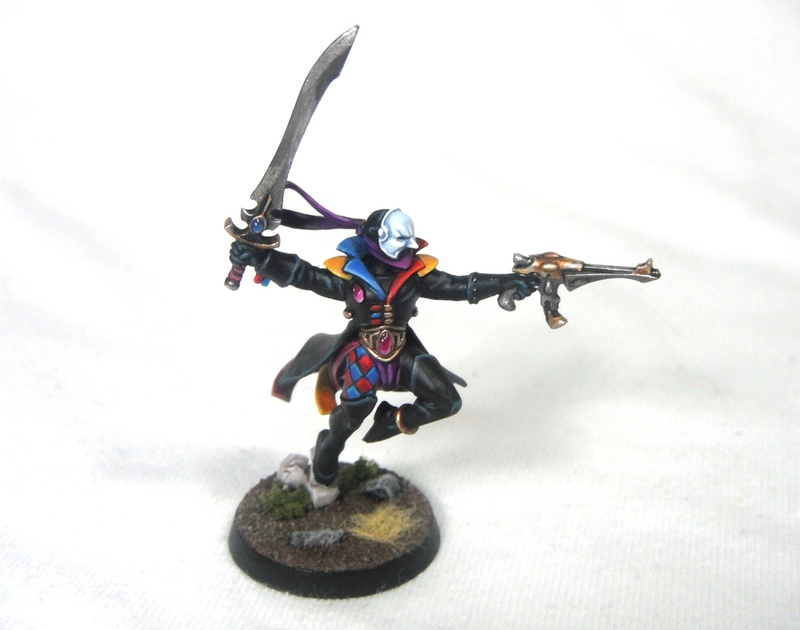 I have finished another Windrider Host. 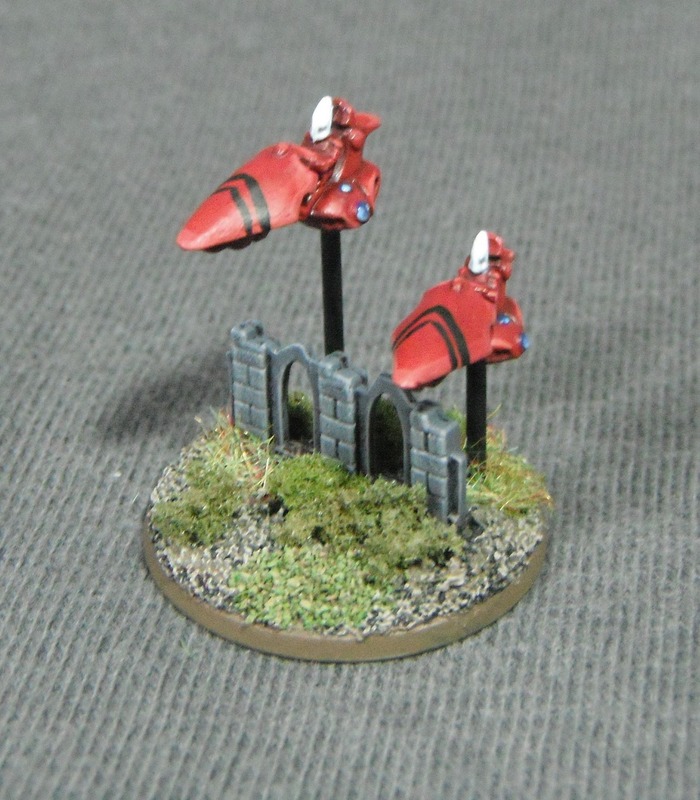 Well, I say finished, they are still in need of some freehand on the canopies. The ideas was to use different designs on each of my formations in order to distinguish them from one another. My previous formations use the two symbols commonly associated with Saim Hann: the cosmic serpent and the two entwined serpents. I have yet to decide on what to use for the third unit. Has anyone got any suggestions? 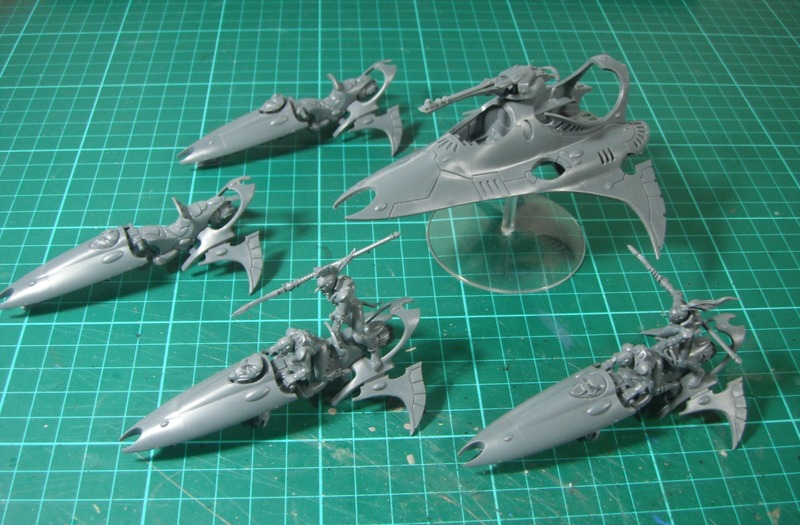 That’s a lot of jetbikes but then it is a Saim Hann army. 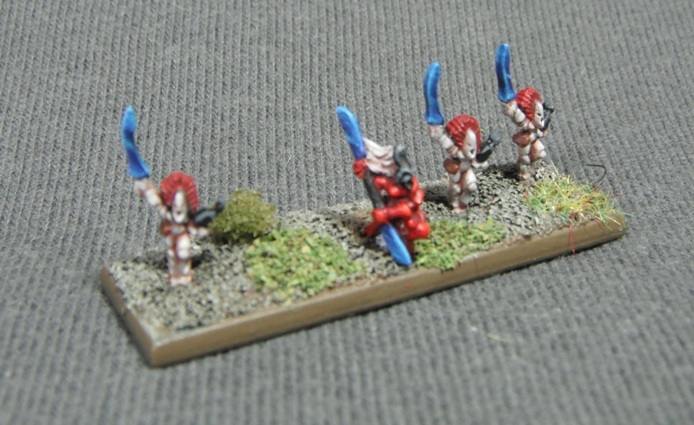 In addition to the jetbikes I have also painted up some Eldar Rangers. These have been finished a while now although I have yet to field them in a game. I put fewer models on each stand and tried to make them look as though they were moving through dense terrain, hence there are more ruins and bushed on the bases than on my Guardians. 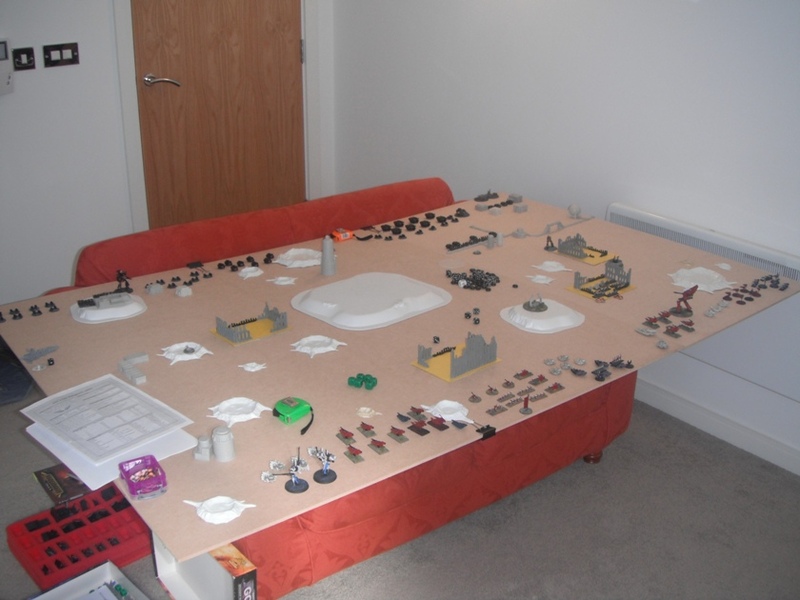 Last week I played my first couple of games of Epic: Armageddon, one at the local club and the other at my friend Gus’s house at the weekend. I must say, I certainly am impressed. The game flowed smoothly and, despite being unfamiliar with the rules, was quite fast-paced. The rules are very intuitive making them easy to pick up. There are also a number of original and interesting rules that make the game very different from anything else by Games Workshop that I’ve played. Aspects of the game that I particularly like are the activation sequence and the way blast markers work. For me, both of these rules are simple differences which really influence how the game is played. The alternating activations is more fun than the ‘you go-I go’ turn sequence of 40k as both players are involved at all times rather than having to wait ages while your opponent moves every model in his army. It also makes the game more tense and tactically challenging as you cannot be certain what is going to happen in the turn. 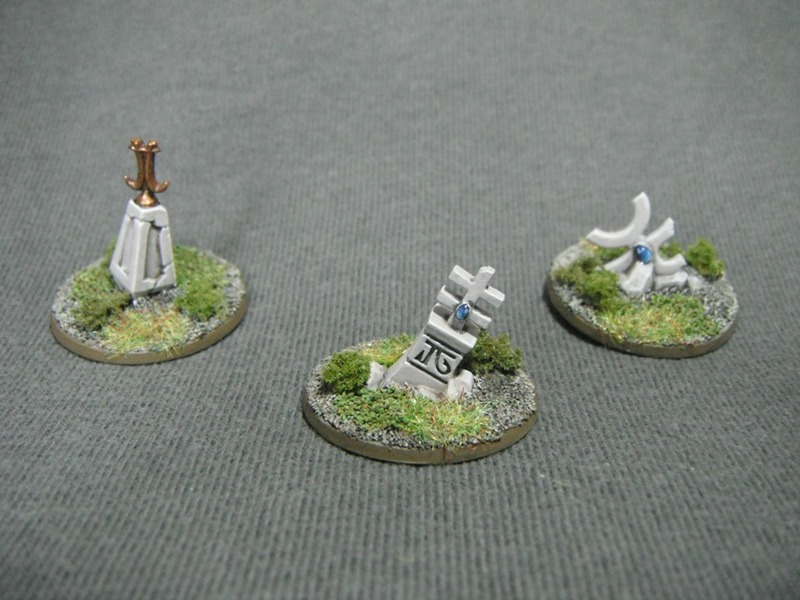 Blast markers are also a simple but effective rule and represent the psychological aspect of battle without being overly-complicated. 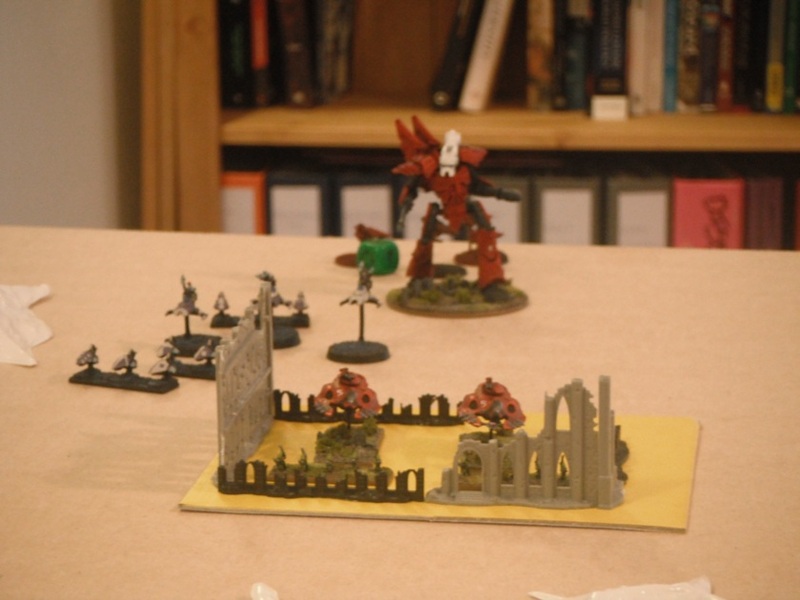 The second game was a 6,000 point Eldar vs Chaos game played at Gus’s apartment on his work-in-progress board. 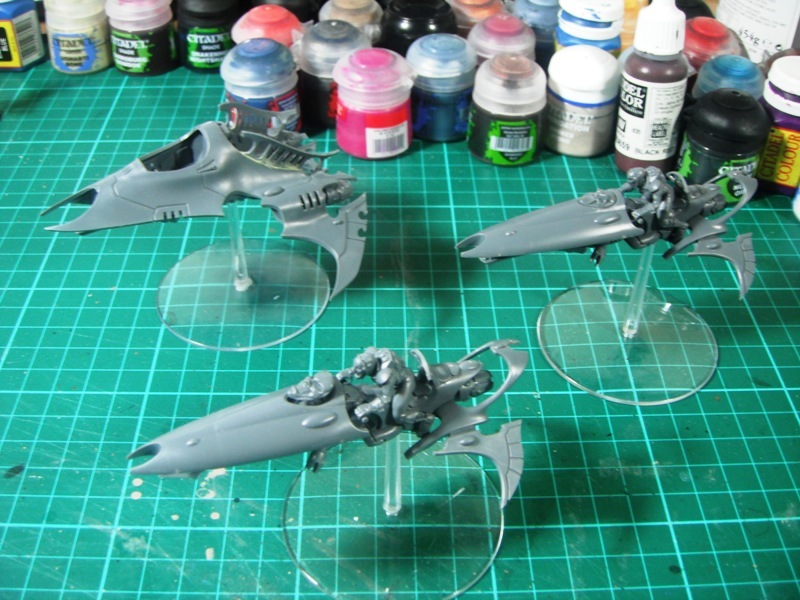 The Eldar force was made up of 3,000 points of Saim-Hann contributed by myself and 3,000 points of Ben’s Eldar. The game was great fun but ended in a 0-0 draw after turn three owing to time constraints. 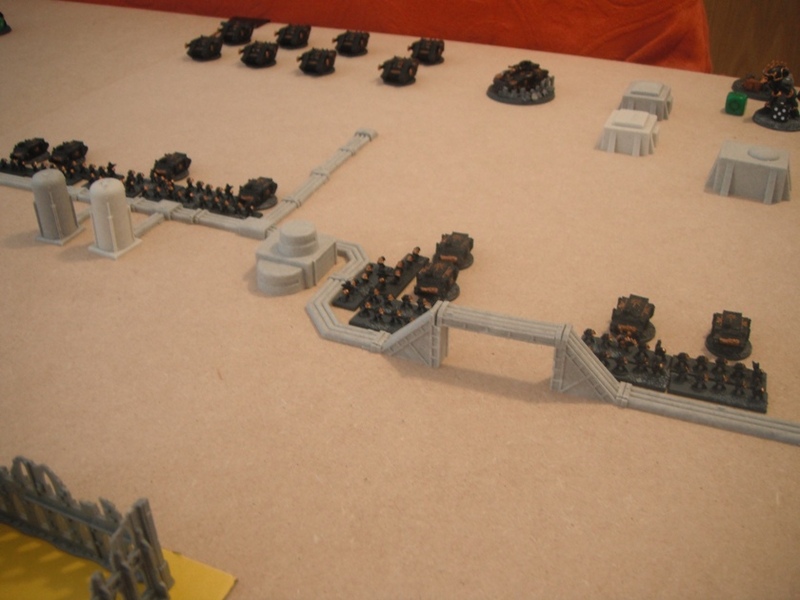 Although neither side had achieved its objectives, the Chaos force had gained the upper hand and had more formations on the table at the end of the game. I think if we had continued Gus would probably have won. Overall this was a great gaming experience but I still have a lot to learn about Epic: Armageddon and fielding Eldar in particular. I’ll leave you with pictures of some highlights from our game. Here is my Phantom Titan. The model itself is from the Epic 40,000 era. Although it is a little clunkier than other iterations of the Phantom I really like it and think that the model has real weight and presence. I tried to assemble the model with more dynamism than you get from the stock model and this involved turning the hips slightly and positioning one leg in front of the other. A lot of pinning was needed in order to get it all to hold together but this should have the added bonus of providing the model with plenty of durability in play. 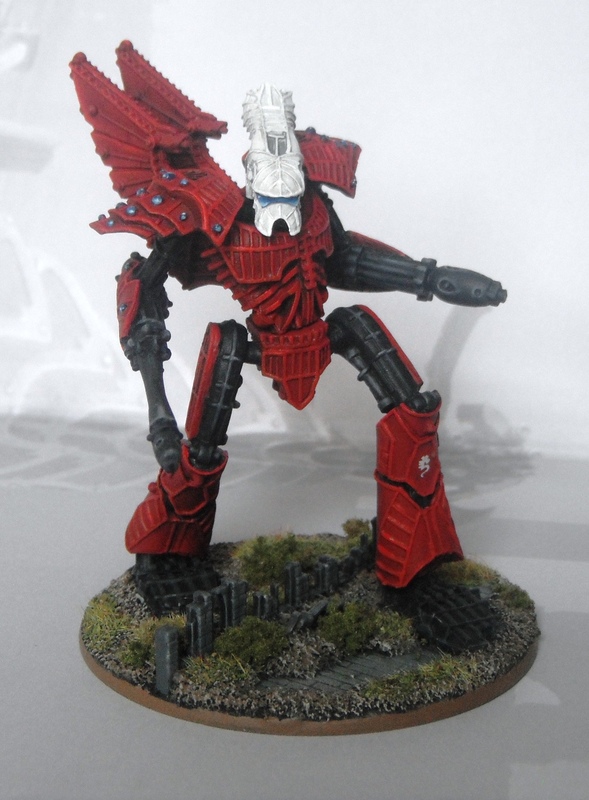 The angle of the head reinforces the sense of movement as though the titan is striding forward over some ruins and turning to face a new target. Painting wise I tried something a little different and applied zenithal highlighting with an airbrush. This adds to the sense of size by providing shadow. I’m not sure how noticeable the effect is in the photos. 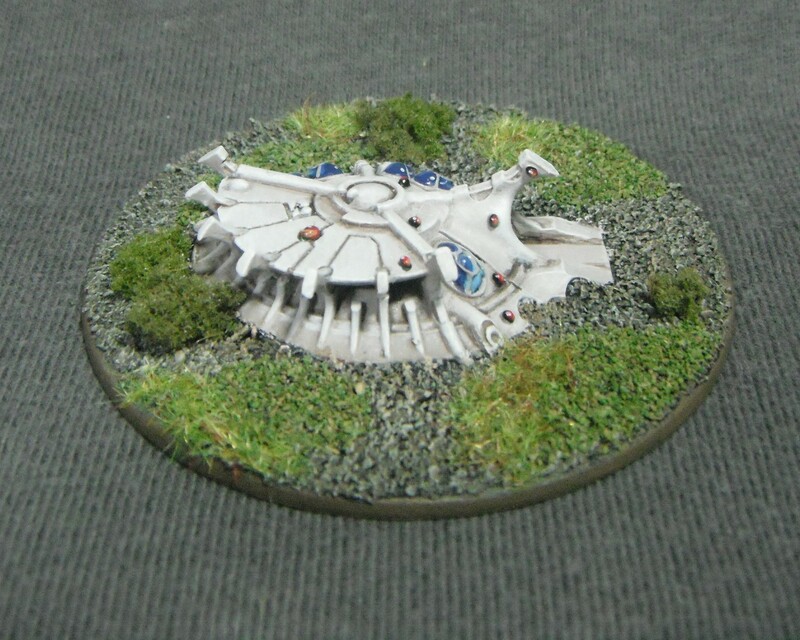 The ruins on the base are also there to provide scale.